Colorado has the highest elevation of all the U.S. states, and it has some of the tallest mountain ranges in the U.S. as well. The state’s mountain scenery is arguably the most majestic and dramatic in the country. The State of Colorado was named after its great river the Colorado River, which Spanish explorers called Rio Colorado, meaning ‘colored river’ for the reddish sandstone soil carried down river from the mountains. It was also believed at the time that the Colorado River originated in the territory. Colorado’s topography is made up of breathtaking mountains, forests, high plains, mesas, canyons, plateaus, rivers, and desert lands, all of which adds to the appeal of the region. 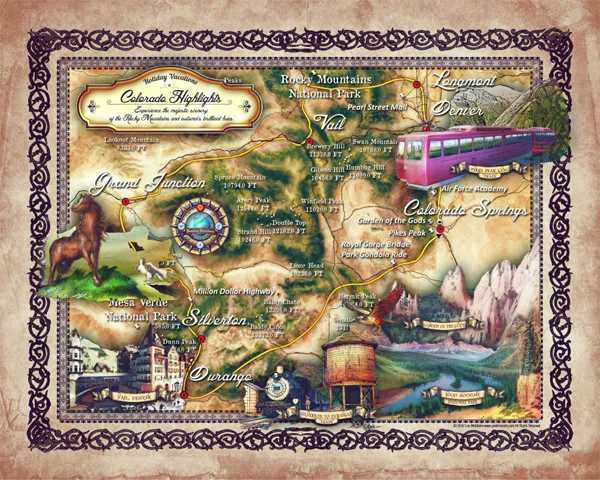 Lisa Middleton’s map of Colorado illustrates and identifies some of Colorado’s national parks, landmarks, monuments, mountain ranges, as well as other attractions. She combines pictures and labels to illustrate some of the very best parts of Colorado. The western Colorado cities of Silverton, Durango, Grand Junction adds to Colorado’s rich history of gold mining, railroads, and farming and ranching respectively. Northwest of Boulder, the Rocky Mountain National Park is a visual representation of the sheer natural beauty of Colorado, with lush evergreen forest and high mountains and lakes, and diverse wildlife. The Mesa Verde National Park on the other hand, offers a glimpse of an ancient culture, housing incredible Ancestral Puebloan dwellings in southwest Colorado. Colorado is home of Air Force Academy just north of Colorado Springs, the Pearl Street Mall-a red-brick pedestrian-only mall in Boulder, and the Royal Gorge Bridge- the world’s highest suspension bridge. Gondola rides over the bridge offers breathtaking views. The Garden of the Gods was designated a National Landmark in 1971, and showcases majestic scenery, with dramatic sandstone rock formations and snow-capped Pikes Peak in the backdrop. Vail, an alpine village in the heart of the Rocky Mountains, boasts the ultimate Colorado ski resort. It is viewed by many as the prime example of what a ski resort should be. Middleton’s map further identifies some of Colorado’s highest mountain ranges, and most notable is the famous Lookout Mountain which is said to be the gravesite of William Frederick “Buffalo Bill” Cody. Middleton captures some of the best attractions that Colorado has to offer, which represents history, culture, and national significance. The Rocky Mountain State is a scenic, adventurous paradise that continues to offer wonderful opportunities to explore and enjoy. This is a digitally colored map, designed by Lisa and her team.